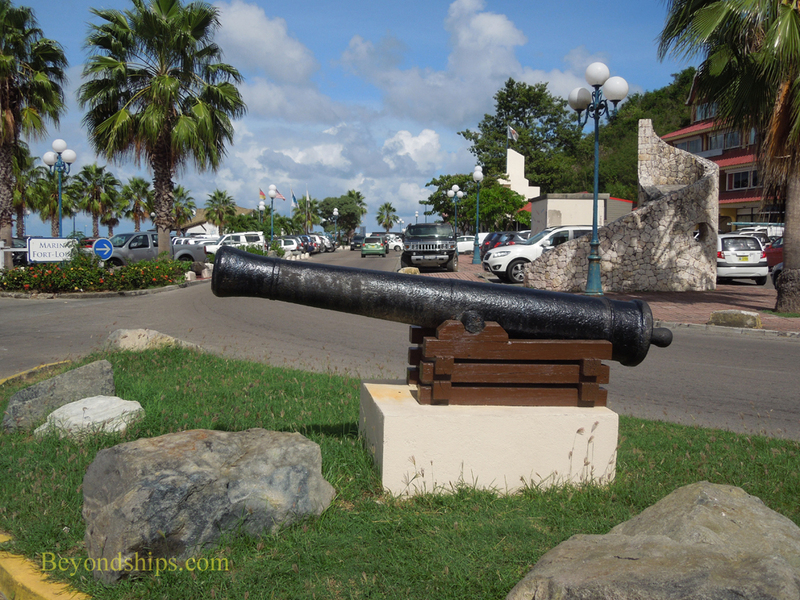 Above: A cannon on display on the Marigot Waterfront. 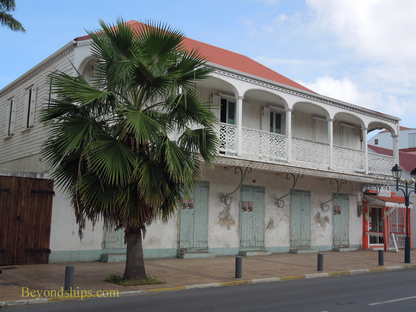 Below: Marigot has retained several West Indies style colonial buildings. Right: The Port La Royale Marina. Marigot, the capital of the French side of the island, proceeds at a different pace from Phillipsburg. Here, things are more relaxed. Life is to be savored. The town rejoices in its reputation for good food in its cafes and restaurants as well as in its reputation for upscale shopping. 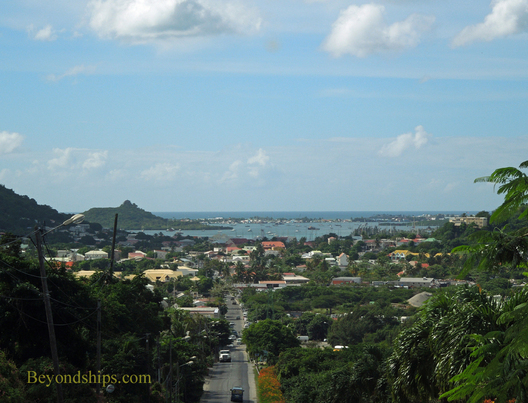 Marigot is not as constrained by its geography as Phillipsburg. As a result, it is more spread out. There are two areas, however, that are of particular interest to visitors. 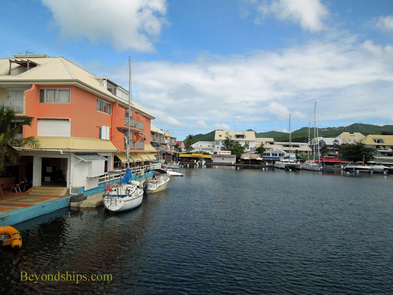 First, there is the Marigot Waterfront area. 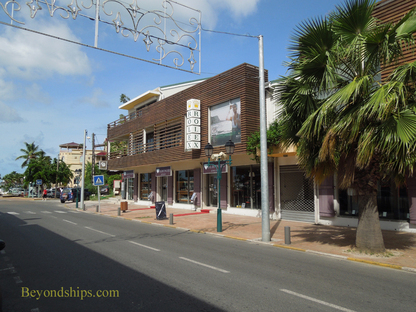 Here, you will find shops, sidewalk cafes and by the shore, the town's open air market. 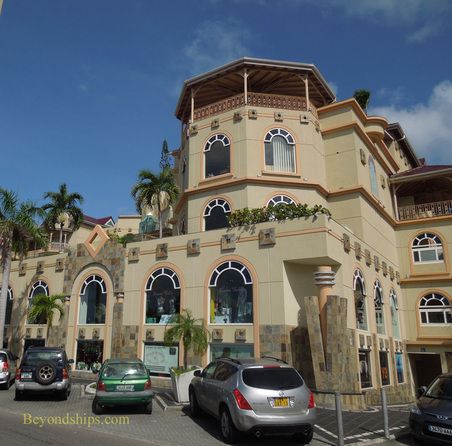 There is also the 22 shop Le West Indies shopping mall. Second, there is the Port La Royale Marina. This is not only a boat basin but is a complex including boutiques and restaurants. 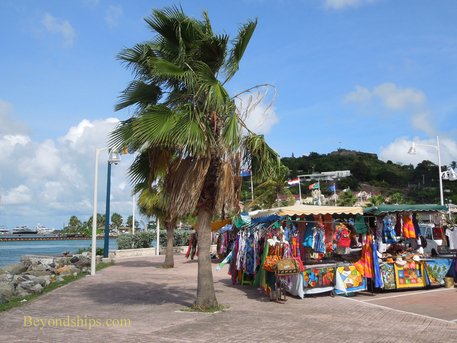 One feature of Marigot is the open-air Marigot Market by the waterfront. Each day locals bring brightly colored fabrics, crafts and souvenir items for sale in open air stalls. 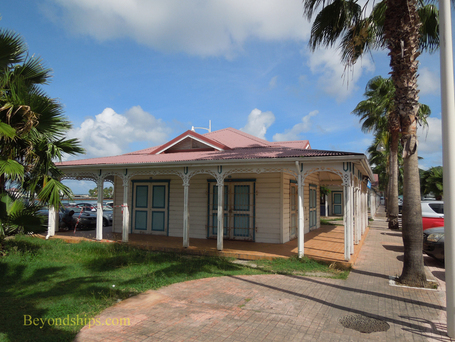 In addition, twice a week, the market expands to encompass the wharves on the Blvd. de France. 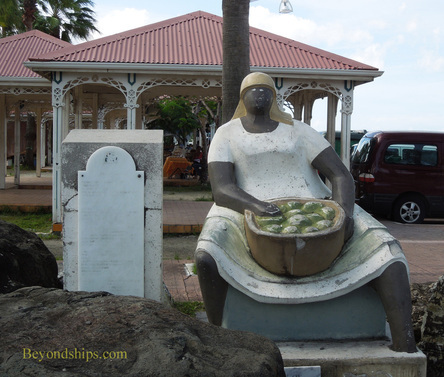 On offer are such things as freshly caught fish, spices and tropical fruits. Shopping in Marigot has a different focus than in Phillipsburg. It is not so much about bargains but rather about luxury, elegance and fashions straight from Paris.